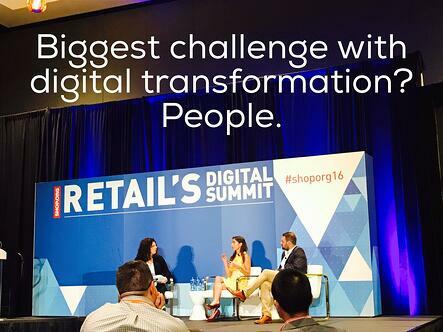 At this year’s Shop.org Retail’s Digital Summit, we all got a glimpse at the future of retail. Both technology and consumer demand will drive the challenges and opportunities for the retail landscape ahead of us. First, the speed and disruption of new technology is only going to increase. Keeping pace requires new systems of flexibility and coordination from retailers in-house and across the aisle. Who’s ready for “blink to buy” contact lenses? The second trend was something we all already knew: The customer is now completely in charge of where and when and how they shop. Only the most authentic, meaningful, and convenient experiences win the sale. There are hundreds of creative ways folks throughout our industry are finding to personalize and innovate to drive engaging experiences. Getting as much data and empathy for your customer is at the center of this challenge. Also called “boundaryless retail” by some HSNi CEO Mindy Grossman spoke to the idea that commerce is now distributed to the point of consumer. We’re calling it distributed commerce. For consumers it’s just shopping. They want it to be streamlined and natural. This new system is not something traditional retail is structured for and requires innovation, collaboration, power of technology to collaborate. Learn more about how brands are winning at distributed commerce. Physicist and futurist Dr. Micho Kaku spoke to a crowd about how artificial intelligence, robotics, virtual reality, and wearables might combine to further push the boundaries of shopping expectations. “Information will be everywhere and nowhere, invisible yet always at our beck and call,” he explained. No matter what the future holds for path to purchase, retailers are going to need to unify the customer journey. Mike Amend, Executive Vice President of Omnichannel at JCPenney, shared his company’s success with a customer-focused strategy. More than half of every online orders from JCPenney.com also came from offline stores. The retailer rolled out a online order, same-day pick-up program in 770 stores nationwide. Every retailer is seeking to solve the “last-mile” challenge in terms that are best for their shoppers. Read our advice. Total Retail Editor-in-Chief Melissa Campanelli sat down to discuss exactly how companies are weathering the Transformation for Digital-First Commerce with Geoff Scully at Shop Direct and Neda Navab at Enjoy.com. The biggest challenge in becoming digital-first is transforming processes and the people. Leading the charge is people in house who can play the role of digital transformer. Do you have what it takes to be a digital transformer? Change in our industry is an ongoing constant. While the products, brands and customer targets may vary, retail as a whole is still figuring out the best way forward. Jason Goldberg at Retail Geek pointed out during the show that retail is 4,000 years old; while digital commerce hasn’t yet turned 20. There’s still a lot of innovation and change to come. We'll be keeping you informed on the latest industry insights.